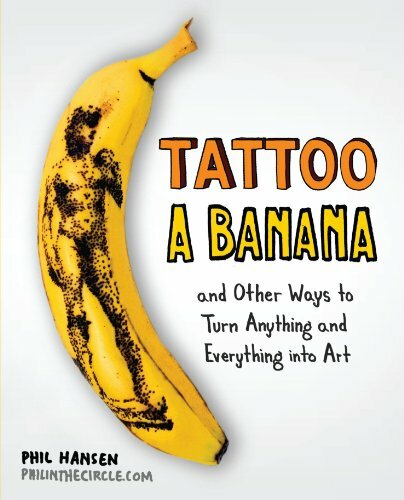 Tattoo a Banana and Other Ways to Turn Anything and Everything into Art is unique because of its universal appeal to children and adults. The typical turn off of books in this genre is the varied and pricey materials required for each of the projects. Not so with the projects in Tattoo a Banana. What’s distinctive about Phil Hansen’s book is that the supplies necessary for all of his projects are easily accessible, in fact, so much so that they are typically found around one’s home. Mr. Hansen’s fun and creative projects use everyday materials such as bananas, thumbtacks, trash bags, and permanent markers. To say the least, this book makes arts and crafts affordable. The suggestion is that any and every object one encounters may be employed in creative purposes. Phil Hansen’s view of the world is inspiring—reminding the reader of artists who work in found art media. Phil Hansen offers up an inspiring opportunity for anyone to incorporate creativity and inventiveness into everyday life. This reviewer has many fond childhood memories of art projects with Mom using everyday “stuff” and wholeheartedly appreciates Mr. Hansen’s approach. Transforming a large cardboard box into a majestic castle is one of my most treasured memories. The projects featured in this book appeal to all ages and are as interesting and elaborate as you choose to make them. They can serve as basic arts and crafts projects for younger children as well as thought provoking and innovative artistic explorations for adults, allowing us to discover or rediscover the artistic self within. Tattoo a Banana presents an informal and unorthodox approach. Hansen focuses on art making that is fun, giving readers a free pass to go with the flow and just create. No formal training is required. This book will serve children and adults alike in serving up a fun and boundary challenging experience. In expanding our notions about art, Phil Hansen suggests new ways to see the world: a robust view unfettered by preconceptions of what Art really constitutes. Eva Sturtz is an Alumni of Moore College of Art & Design with a Bachelor of Fine Arts. She lives and works in Philadelphia at a nonprofit organization connecting veterans and families to housing, substance abuse counseling, and a full spectrum of social services with the hope of enabling them to reclaim their lives.